9/11 social media flubs: Let's turn off the Internet every Sept. 11. 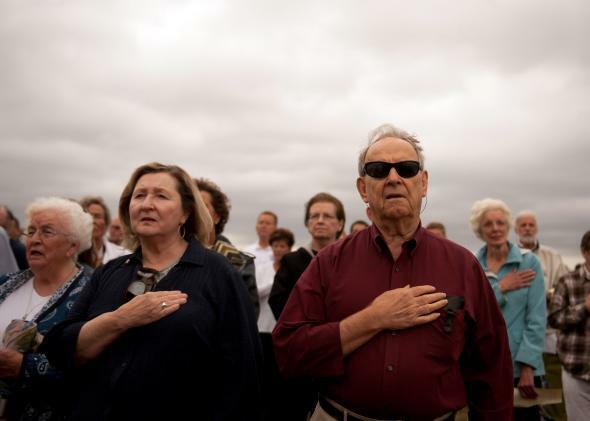 People gather in Shanksville, Pennsylvania, to mark the anniversary of the Sept. 11 attacks. No computers, tablets, or smartphones in sight. This Sept. 11 is just a little over two-thirds over on the East Coast, and it’s already thoroughly nauseating. This is due in large part to corporate social media accounts, and brands’ insistence on marking the anniversary of the deadliest terrorist attack on American soil with tweets and ads that come across as queasily incongruous at best. (At worst, they are shockingly opportunistic, like Bikram Arlington’s instantly famous “9+11 = 20% OFF!” tweet.) Meanwhile, editors at every blog and news site (including this one) have looked for new angles on the attacks of 13 years ago, publishing or re-publishing rote essays about how 9/11 changed [fill in the blank]. Everyone feels that they must say something new about 9/11, even though no one has anything new to say. I have a proposal for preventing this distressing state of affairs: Shut down the Internet for 24 hours every year on Sept. 11. Most of the things we do online are means of distracting ourselves from existential angst, but if ever there’s a day for confronting our existential angst instead of running from it, it’s Sept. 11. After all, fear, anger, and sadness are never far from the surface on Sept. 11. The tension between these feelings and the trivial absurdities of everyday life is the reason we feel unsettled seeing the masturbatory aid company Fleshlight use the hashtag #911neverforget. Better not to let Fleshlight—or anyone else—tweet anything at all, so that everyone can process their feelings about Sept. 11 without diversions. I’m not suggesting that everyone should mark Sept. 11 in the same way: 9/11 means different things to different people, and temporarily shutting down the Internet would allow people to do whatever feels authentic to them. Imagine if you couldn’t get online today: You might choose to read the newspaper, go to the office (and actually get work done instead of procrastinating for once), go to a protest, walk your dog, call your sister, write a letter to a congressperson, visit the 9/11 Memorial. You could still do pretty much anything you choose. You just wouldn’t risk coming across a Spotify playlist called “In Remembrance,” or a BuzzFeed listicle called “27 Moving Images of the Nation Remembering 9/11,” because such things wouldn’t exist. How would an annual national Internet blackout work? I’m not sure. It’s unlikely Internet service providers would suspend service en masse (although, given the proposed Time Warner-Comcast merger and general lack of competition in the industry, it’s not entirely out of the realm of possibility). Perhaps individual websites could voluntarily close up shop, in the hopes that others would follow. It would be a constitutional nightmare for the federal government to pass a law banning online discourse on Sept. 11, but maybe the government could nudge everyone in the right direction by suspending all government social media accounts and temporarily taking down all but the most vital .gov sites. Of course, Internet users could always boycott cyberspace on Sept. 11 every year. The only problem with this approach is that the most cynical and tone-deaf tweeters and publishers would continue to tweet and publish regardless of the boycott, and we’d have to confront the aftermath when we logged back in on Sept. 12. That’s why a wholesale shutdown is the best approach: It would save us from the Bikram Arlingtons of the world, and would save them from themselves.